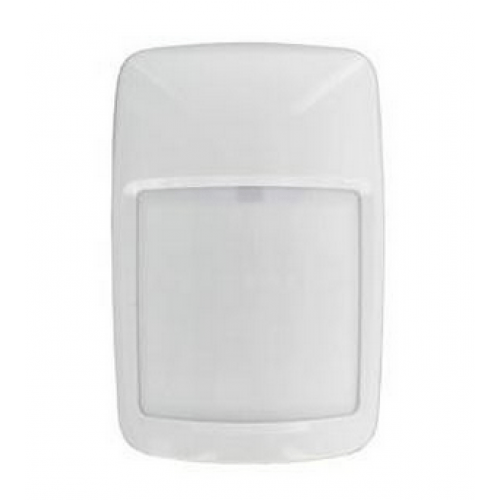 The Honeywell IS312 is a passive infrared motion sensor, featuring a silent relay for use in quiet environments. Its the ideal sensor with a smooth white housing that is designed to blend with any décor in residential and light commercial applications. The motion sensor has select-able pet immunity which can distinguish between signals caused by humans and signals caused by pets up to 36kgs. The IS312 is easy to install and offers a convenient wiring channel, knockouts for mounting and wiring and easy access to wiring terminals. To make installation easier, mounting screws are conveniently secured inside the detector rear housing. (mounting bracket not included). Dip switch setting allows easy setting of the unit parameter with a range of 12 metres x 17 metres PIR with creep zone. Compromising the IS312 is inhibited by the look-down zones by the patented look-down mirror providing optimum detection directly beneath the sensor. A Tamper Switch activates before access to the circuitry is possible. Sabotage-resistant lens design and magnet-proof relay. Unit has a bug guard preventing insect access to the sensor optics and reduces the chance of false activation. An attractive, sleek designed unit measuring only 83mm height x 56mm wide x 43mm depth. 1 Years Manufacture Warranty included by the manufacture, Honeywell. To complete the installation of this product you may be interested in Screwdriver and Spirit Level with Vial. This item was as described and fast delivery will use again. Electrical World Replies: This sensor will work on the majority of alarm systems as most systems have 12v output and use a normally closed circuit which changes to normally open upon activation . Changing it would depend on your experience. There is a few things to point out if you do take this job on such as make sure not to touch the + and - cables together as this could cause your main aux fuse to blow in the panel another thing would be make sure not to touch the passive infra red sensor on the circuit board inside the sensor as this can damage the sensors operation. Electrical World Replies: N and NC are the alarm contacts. T1 and T2 are the tamper contacts.